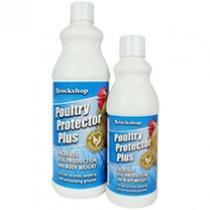 Stockshop Poultry Protector Plus is a natural cleaner that uses enzymes to eliminate odours and organic contaminants, as well as providing a natural solution in the treatment of mite, fleas and tick infestations. It helps to provide your birds with a healthier and happier environment that allows allows them to produce more eggs and gain weight faster. - Safe to apply directly to birds as well as their surroundings.